Contrary to various claims of self-appointed ones (Ronald Weinland may be the one once associated with the old WCG getting the most coverage falsely claiming this), the Great Tribulation has not started and cannot begin in 2010. Some criticized me when I pointed out previously that it could not start in 2008 (see Great Tribulation Will Not Begin in 2008 and James Malm Challenges COGwriter) nor in 2009 (The Great Tribulation Cannot Begin in 2009). And although there were various troubles this year, the Great Tribulation did not begin then. Because I tried to heed Jesus’ admonitions to “watch” (Matthew 24:42, 25:13; Mark 13:9, 33-37; Luke 21:36; Revelation 3:3) and to compare world events to biblical prophecies. All should understand that before the Great Tribulation could begin that there needed to be a King of the North, a King of the South, and European military that would be quite strong (cf. Revelation 13:4). Because of this deal not yet being made (that “he” will be the one who will become the final King of the North), there is at least 3 1/2 years (half of a prophetic week) before the Great Tribulation can begin–which means that the earliest year it could possibly begin is in 2013. And I suspect it will be a bit later than that. Additionally, while there are the beginnings of certain organizations that will probably contribute to the rise of both the King of the North and the King of the South in 2009 (see EU Parliament to Host Seminar for the Union for the Mediterranean States Tomorrow and European empire formed yesterday, but few in America seemed to notice), they are not ready yet. It is true that there is a new European President and that he might fulfill Daniel 11:20 (Herman Van Rompuy Takes Office Today: Might He Fulfill Daniel 11:20? ), if that verse has a 21st century fulfillment (which it very well may). However, in order to be able to destroy the United States and its Anglo-allies, the Europeans would also benefit from having their own military satellite tracking system–and while that may not be an absolute requirement, they will not have their own ready until around 2013 (see EU Approves Galileo For Military Use) or perhaps later. Additionally, Europe still has not benefited enough from its Large Hadron Colider project–which may be where it will develop a major military advantage (see September 10th is Not the End of the World), which it would seem to need to fulfill biblical prophecy (cf. Revelation 13:4). And as mentioned before, since the deal in Daniel 9:27 has not been made, it will be at least 3 1/2 years before the King of the North can stop the sacrifices. Of course, the sacrifices must start before they stop. And while it is remotely possible that regular sacrifices will start in 2010, that is remote. But even if they do, they will not be stopped by the final King of the North in 2010 (at least not in the manner to fulfill Daniel 11:31). As far as the King of the South goes, there simply is not a confederation of Islamic nations that work close enough together in order to be led by the King of the South. While it is true that there are two groups that ultimately may ultimately allow this (see Iraq & the King of the South and Mediterranean Union Makes Deal With Israel and Arab States)–the situation in the Middle East is not quite ready yet. The Islamic Mahdi has not yet been recognized, and while that is remotely possible to occur in 2010 (and some suspect that Barack Obama may help that, see Barack Obama in Islamic Prophecy? ), the King of the South also will not be ready militarily to fulfill prophecies such as those in Daniel 11:40. I strongly believe that God will more powerfully use the remnant of the Philadelphia era of the Church of God to proclaim the good news of the The Gospel of the Kingdom of God and that the “short work” of Romans 9:28 will still happen–but even though the Living Church of God is busily continuing the Philadelphia-era work, and did very well in 2009 with that, it will not be able to complete this work in 2010. And of course, since the 6000 years of God’s plan apparently has several years left (see Does God Have a 6,000 Year Plan? What Year Does the 6,000 Years End? ), the fact that all the other signs mentioned in this update are not ready yet (though events seem to be working towards that objective), the Great Tribulation simply cannot begin in 2010. The end is coming. The end is soon. But the end (meaning the beginning of the Great Tribulation) will not start in 2010. Nor can the Great Tribulation start prior to 2013. However, Jesus spoke of something that He referred to as “the beginning of sorrows” (Matthew 24:8). And this involves false religion, earthquakes, famines, pestilences, and war. And that certainly could start in 2010 (and it is remotely possible that it started in 2009). While 2010 is not going to be the start of the Great Tribulation, it certainly could be a very rocky year. A while back, I read what is apparently supposed to be the major “nonfiction” book by Timothy LaHaye and Jerry Jenkins, the authors of the popular fiction series Left Behind. Sadly, many millions seemingly have been deceived by this false “pre-tribulation rapture” hypothesis. And partially because of this, they will not understand the final events of the end-times until it is too late. Those Protestants who believe in a pre-tribulation rapture are essentially certain to be left behind when the true Church flees as they do not realize that the Bible clearly shows that the most faithful flee to the wilderness (Revelation 12:14-17)–and heaven is not a wilderness. Also it should be pointed out that the Bible shows that true Christians who are not “gathered together” (Zephaniah 2:1a) with the Philadelphians “[b]efore the decree is issued” (Zephaniah 2:1b) will themselves be left behind (Revelation 12:17) as only those gathered together may ”be hidden in the day of the LORD’s anger” (Zephaniah 2:3). Posted in Prophecy, Religious News | Comments Off on Will Protestants Be “Left Behind”? “And there you shall build an altar unto Hashem your God, an altar of stones: you shall lift up no iron tool upon them. You shall build the altar of Hashem your G-d of unhewn stones.” (Dvarim / Deuteronomy 27:5,6). For many years, the Institute has been examining ways of building a model of the altar from whole stones that had not been touched by iron tools. In the end, the Institute commissioned artist Assaf Kidron of Givot Olam Farm at Itamar, Samaria, to design and create a model which conforms with the specifications described by authoritative Jewish sage Rambam (Maimonides) – one cubit wide, one cubit deep, and three cubits high. It has been placed in the Institute’s visitor center. The rocks were collected from the Dead Sea (http://www.israelnationalnews.com/News/News.aspx/135199). The rest of the scripture in Deuteronomy talks about using the particular altar for burnt offerings and peace offerings. An altar project was mentioned at COGwriter two weeks ago (see Sacrificial Altar to Be Built in Jerusalem–though it is unclear if these are the same altars as the other one is to be portable–though in the back of a flatbed truck, the above altar would be portable). Altar construction represents an important step in biblical prophecy. For while the goal of the Temple Institute is to build another temple, only an altar is actually necessary for sacrifices to resume. For while an actual temple is not needed for sacrifices according to the Bible (Ezra 3:6) and the Temple Institute (Why is a Jewish Temple in Jerusalem Not Required? 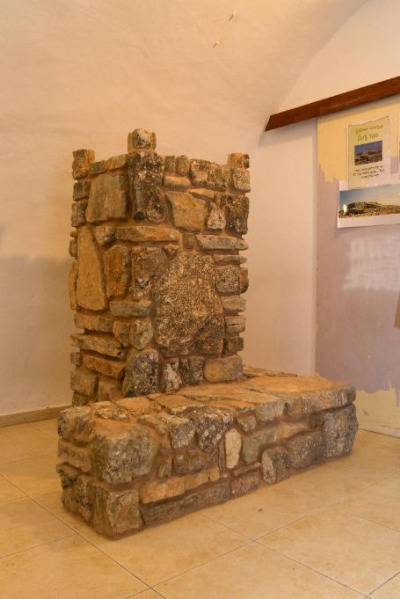 ), a sacrificial altar is (Ezra 3:2-3). And as watchers of biblical prophecy are aware, the Bible is clear that the final King of the North will stop sacrifices (Daniel 11:31) and then Christians are to flee per Jesus statements in Matthew 24:15-21 as the Great Tribulation will be ready to start. America to be Replaced By China or Europe? …The rise of China may in the future demand more forceful leadership in the West. Given the realities of geoeconomics it is not inconceivable that a far more dynamic leader such as German Economics Minister Karl Theodor von und zu Guttenberg might one day be in charge...If America declines, will Europe fill the vacuum, partly in response to the Chinese challenge? To some this seems unlikely but think back to the world of only a scant 10 years ago when the Anglo-American model of stakeholder capitalism stood triumphantly (and perhaps a tad arrogantly) and practically alone on the top of the heap, and how much has changed since then. The Bible tells of the rise of the “daughter of Babylon”. Babylon is place that the Europeans tend to consider is appropriate as a reference to their union. And according to biblical prophecy, the description of the future “Babylon” fits Europe much better than China (though it will apparently trade with it). Posted in Prophecy | Comments Off on America to be Replaced By China or Europe? 2010 preview: Will a neutralino steal Higgs’s thunder? Apparently the American military considers that this type of project has major military potential, and others in the USA seem to agree. The fact that USA military wants to keep quiet about it may be a reason that CERN denies the military potential of its own project. Those spinoffs now will invigorate the careers and labs of Europe, not the United States, pointed out Steven Weinberg, a physicist at the University of Texas in Austin, who won the Nobel Prize for work that will be tested in the new collider. Americans will work at CERN, but not as leaders, he said in an e-mail interview. My book also discusses the destruction of the USA and certain others by the Europeans sometime after 2012. The Large Hadron Collider is discussed as one of the items that may provide the Europeans with the ability to overcome the USA’s military might. The Large Hadron Collider set one or more speed records in 2009 (Europe’s Large Hadron Collider Sets Another Record, USA is Losing Lead in Physics). It is likely to set other records and help scientists learn more about physics in 2010. And this data may lead to the development of military technology of unbelievable power–but for the Europeans. Worldwide Church of God–Canada is in the process of changing its name to Grace Communion International-Canada. In a recent survey, Canadian congregations voted 60 percent to 20 percent in favour of the change. The US branch of the church made a similar change in 2009. The denomination was founded by radio preacher Herbert W. Armstrong in 1934 and was widely considered a cult at one time but has since become accepted as a mainstream evangelical denomination. The fact that the WCG of the USA earlier switched to GCI suggested that foreign affiliates would likely change their names as well. Despite the fact that mainstream groups applaud WCG’s changes since the death of Herbert W. Armstrong, the reality is that the new GCI is no longer a real “Church of God” and the group that was led by the late HWA was. You are all aware by now of the attempt by a Muslim extremist to blow up a Delta airliner. The attack is believed to be in retaliation for the US bombing of an Al-Qaida stronghold in Yemen just yesterday. Thank be to God it didn’t succeed. The massacre at Fort Hood and now this incident during the landing approach of the Delta airliner in Detroit shows that Muslim terrorists intend to continue to target unsuspecting Americans. It appears both Yemen and Nigeria may be implicated in this incident. The reality is that Al-Qaida intends more terror, likes to pick dates of Western significance (yesterday being Christmas), and has no intention of stopping. According to the Bible (Psalm 83; Daniel 11:39; etc. ), the USA is going to fall–perhaps in the next presidential term. And it appears that terrorism will be one of the actions that will help it fall. VATICAN CITY, DEC. 24, 2009 (Zenit.org).- Benedict XVI is unhurt after he was knocked down tonight as he entered St. Peter’s Basilica to celebrate the Christmas vigil Mass, reports a Vatican spokesman. There are many violent people in the world. If you are a regular reader of this page, you know that the real reason that December 25th was chosen as “Christmas” to supposedly honor Jesus was because that date is the birthday of the sun-god Mithras (here is a related article Do You Practice Mithraism?). So, since you probably do not celebrate it, and in most nations most of the stores are closed, other than cleaning up around the house, what can you do? For amusement, you might want to play the Who Wants to be a Biblical Millionaire? game. It is fairly popular and my son Michael is adding questions to it all the time. Actually, if you have not played it in a while, you may be pleased to find that there are about twice as many questions as there were last year. The game is a fun way to test your knowledge and hopefully grow in knowledge (cf. 2 Peter 3:18). Another option would be to study more about the The History of Early Christianity. There is always more to learn and I am frequently updating articles there. You are currently browsing the Church of God News weblog archives for December, 2009.